The TERI School of Advanced Studies in India and ICE WaRM are looking forward to running a fourth Management Development Programme on Gender, Equity and Water Management, this time in the city of Gurugram, India on 19 and 20 December. Previously held in Delhi and the states of Assam and Telangana, the intensive two day programme reaches out to both men and women water leaders from government, NGOs and professionals in the water sector, and introduces new understandings of development with respect to gender equity and water management. 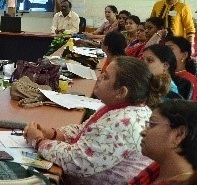 One of the programme sessions examines institutions, gender and equity. Discussions in this session have revealed that equality is about sameness while equity is about fairness. There is no bench mark for equity as it is a value laden concept while equality can be seen as measurable. Equity is more difficult to achieve as it depends on different approaches, perceptions and values of stakeholders. Other dimensions that are often looked at separately or together with equity, particularly in India, are class, caste and religion. In the water sector, institutions have power to provide access to water and its associated benefits. These institutions are not merely groups of people, but rather can be considered to be groups of people bound by a common objective – the management of water resources. When we consider institutions and resource access from a gendered perspective, it helps to understand that men and women access resources differently. Law, property rights and social relationships within institutions, which can be written or unwritten, can differ. Hence, property rights, gender relations, systems of land tenure, markets and rights, all shape access to resources like water differently, and are important for understanding and planning solutions. Registrations for the fourth Management Development Programme on Gender, Equity and Water Management, in Gurugram, India, close 15th December 2018. The programmes are funded by the Australian Government through the Sustainable Development Investment Portfolio.